Now is the time of year when PATC overseers come out of hibernation and start, well, overseeing. That means trail and shelter projects, and when I said ³Spring Work" I was being quite literal. 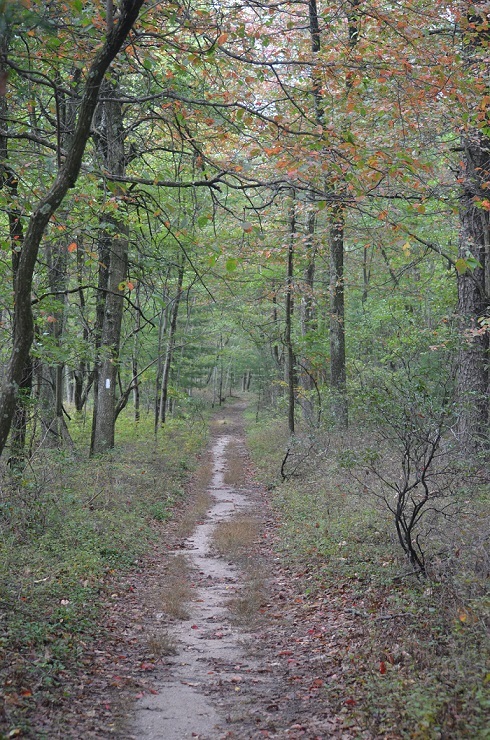 The Reese Hollow Trail is a feeder trail to to the Tuscarora Trail just west of Mercersburg, PA. The recently-completed Reese Hollow Shelter boasts a lovely setting among the ferns, and a reliable spring for water. The shelter is part of the Little Cove Cabin rental property that PATC owns (I¹m the overseer for the trail and shelter). The piped spring dumps its water into a splash pool that sometimes does not hold water. When I see that has happened, I just toss a shovelful of sand into the pool and it temporarily plugs up the holes through which the water drains out. That works for a couple months. But having a reliable splash pool under the pipe is a desirable thing, to serve as a repository for food/beverage items that hikers and users of the shelter may wish to keep cool. So with the help of my 7 year old grandson, Tristan, a couple weeks ago we went up to the shelter to repair/create a better splash pool under the piped spring. The semi-permanent fix for the splash pool was to install a piece of rubber lining left over from my water garden. Then we rebuilt the surrounding stepping stones to make it the spring look completely natural again. --It should be noted that Tristan absolutely did NOT get wet while working on this project (I also have a bridge in NYC I¹d like to sell you). --No post about springs is complete without the mandatory lawyerly statement that no backcountry water sources should be presumed safe for drinking without treatment. 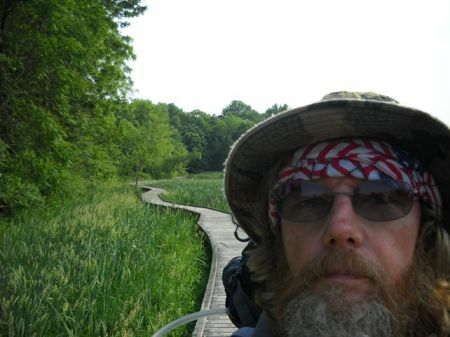 Yes, you can thru-hike the AT.....follow along with our own Ken May this summer via his Trail Journal. He started on April 13(?) in Harper's Ferry as Flip-Flopper #24, heading north. Last time I checked he was in Massachusetts and had logged 500+ miles. 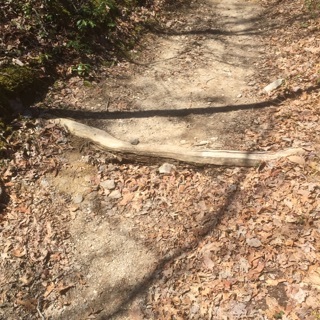 We're hiking along with you, Ken......virtually !!!! “Give me a lever long enough, and I can move the world” (Archimedes) or even more appropriate......"Better to slide it than roll it; better to roll it than carry it; and don’t carry it alone. As a relative 'newbie' to AT trail work in Pennsylvania, I've learned a new language, which includes waterbars & check dams and it all involves very big rocks. In PA, rocks abound near the AT and for check dams & waterbars......the bigger the better. as shown by the skills of Patrick Willson making this bore cut step-through with his new Stihl 661. 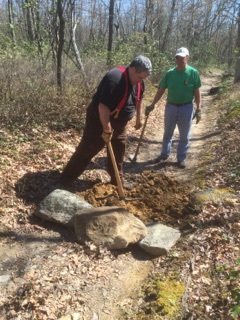 Lugging this size equipment up & down the trails is definitely for the rugged & determined....plus this work crew in May got hit by rain & thunderstorms before the day was out. PATC teamwork was the perfect description of this crew which included the Overseers, plus members of the Blue & White crew, HQ & Yankee Clippers. 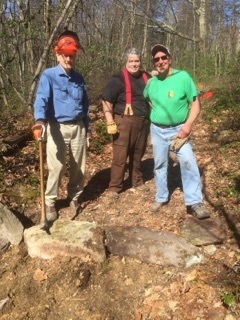 The team broke into 3 subteams working multiple parts of the south two trail sections at the end of Tuscarora Mountain before it becomes road walking to the C&O Canal.trail. Speaking for this summer's hikers......THANK YOU !!! Ever Bite Off More Than You Can Chew ?? ...much like this Banded Water Snake that has a 'grasp' on a much larger BullFrog. The bullfrog is fresh out of hibernation based on the dark color from algae. 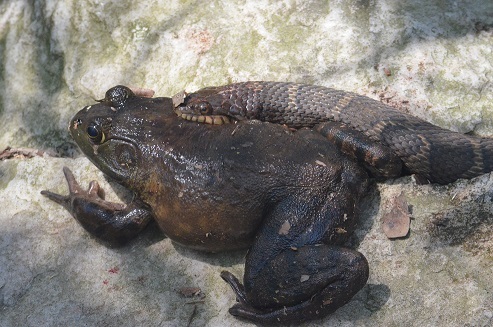 The snake wasn't letting go and the frog appeared to be a bit more than he could chew. Wonder who won & how long this standoff lasted ?? 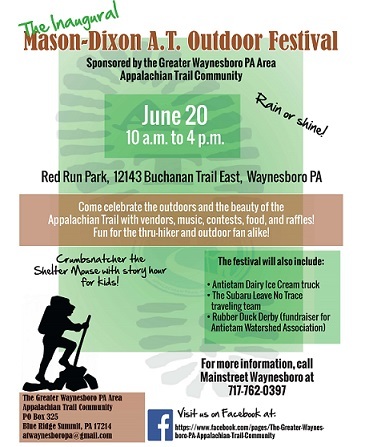 Are you ready for some serious fun.....sponsored by our own Waynesboro AT Community ?? Come join the fun & tell your friends....or better still.....bring them with you !!! WHAT IS THERE TO DO ?? Six bands, starting at 11. Antietam Dairy Ice Cream Truck (and other food vendors). Antietam Watershed Association Stream Cleaner Pinball Game, Water Monitoring, and Rubber Duck Derby (raffle with prizes). Children’s activities. Smokey Bear. Crumbsnatcher the Shelter Mouse. Tri-State Astronomers' telescopes focusing on sunspots, Raffle with great prizes!! (everything from food coupons to skiing lessons to greens fees at Penn National to art prints,etc. so bring your “folding money") Contests for the hikers. Whitetail’s climbing wall. Lots of vendors! AND, the Subaru National Leave No Trace Team will be demonstrating LNT techniques & will lead a hike Sunday morning (Old Forge to Tumbling Run and back) to show good practices along the Trail. WANT TO HELP ?? Help with set-up with vendors (7 - 9:45 a.m.); help with the Duck Derby at 2:00; hiker registration; assist the Blue Ridge Fire Dept. with cooking/selling dogs and burgers; do some shuttle driving for hikers....or just assist with whatever needs to be done. Come early & stay late....volunteers can camp overnight. Please support this AT Community sponsored by PATCNorth !!! 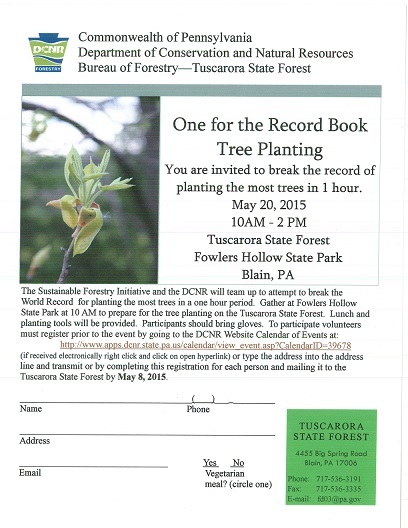 Be a part of a new Guinness Book of World Records.....plant the most trees in 1 hour. Rare Photo....Where are the Toe Bangers ?? is a collectors item, being considered for a wall at the ATC museum in Pine Grove. This section is a favorite of Helen Keller and Stevie Wonder since it can be traversed with your eyes closed or easily at night with a full moon. 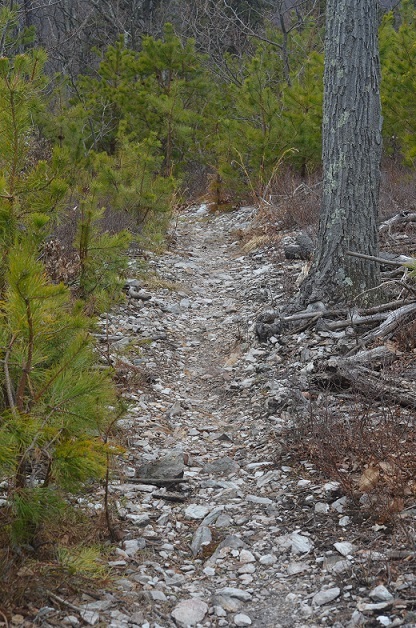 Many AT trekkers will not remember or recognize this section of trail..... because it is the only one in the State! 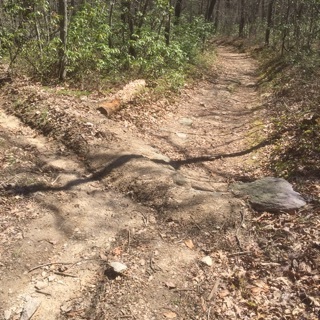 Trail crews have tried & failed to breed this section with the typical PA trails below.....filled with horribly disfigured rocky toe bangers. 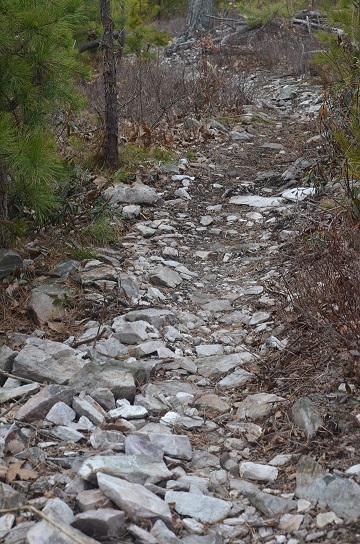 In some sections, crews have taken to filing down particularly sharp rocks.....to the delight of Pennsylvania thru-hikers. 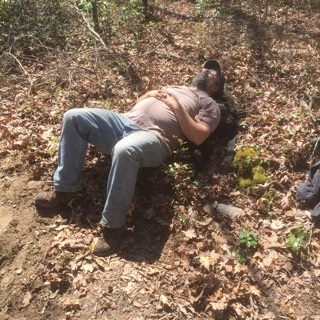 Just remember....when hiking PA trails.....keep an eye on your feet !! Looking for a Sense of Wilderness ?? ....then the Tuscaroara Trail is for you......and needs your help. A 250-mile loop trail started in 1963 & primarily maintained by PATC North Chapter. Eventually it is planned to be part of the Great Eastern Trail which will extend from Alabama to the Finger Lakes in New York state. 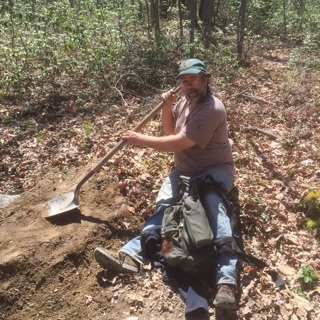 The trail traverses a significant amount of private property so please respect the privilege hikers are being given. 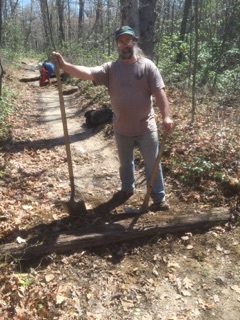 Your assistance with maintainence and/or using the trail would be greatly appreciated. HOW CAN YOU HELP ?? Boots on the trail help keep it open, so lace up & go.....especially if you are looking for a sense of wilderness. Can you imagine what it feels like to be picked up by a creature so much bigger than ourselves?? So I simply got down to turtle level and just scoped out the critter from several feet away without actually touching it. Took a couple photos of this artfully constructed and adapted critter, then backed off and watched it slowly relax, stretch out its legs, and speed off (well, it actually ambled or moseyed, but you get the idea). Now I'm not a strident animal-rights activist (although maybe I should be? 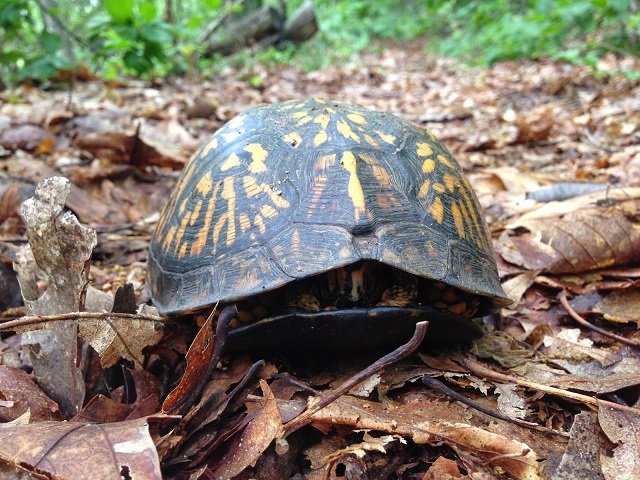 ), and in the future, say, if I am hiking a trail with Mister Tristan (the 6-year old human being, not the blog), and if we encounter a turtle, chances are I will pick it up to show Mister Tristan the bottom shell and the legs. You know, a teachable moment.